Today, Flying pig accidentally obtained a Pet cultivation book, hence specially want to share with you guys (aren’t flying pig you yourself is a pet?). Alright, first of all, let’s look at the different pets positioning! The pets in “Chrono Tales" basically can be played in three ways, where there is 3 types, that is physical attack, magic attack and auxiliary type. Phy. 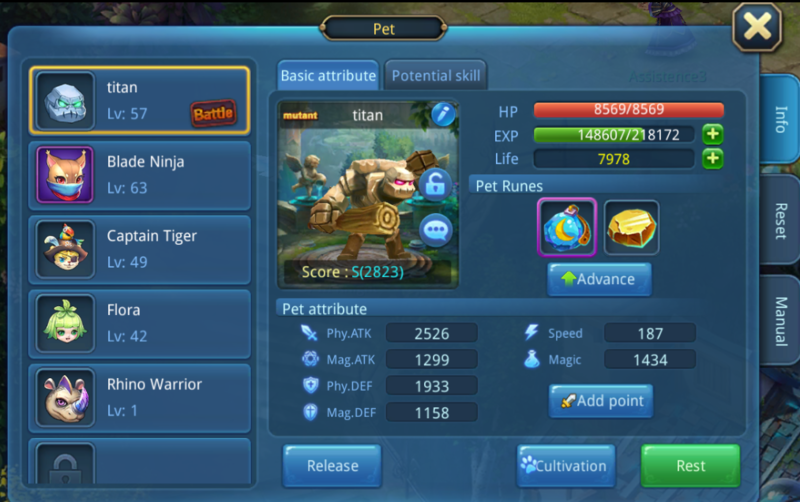 Attack type pets can discharge high single output, and based on pursuit, combo, fury pursuit and other skills’ effect can strengthen the pet’s output effect; Mag. Attack type pets can discharge high group output, with broad coverage, the total output will be stronger than Phy. Atk type pets, but with poorer ability to break through pin-point; Auxiliary type pets normally have lesser attack skills, but with more skills that can enhance itself and master and with stronger self-defence capability. 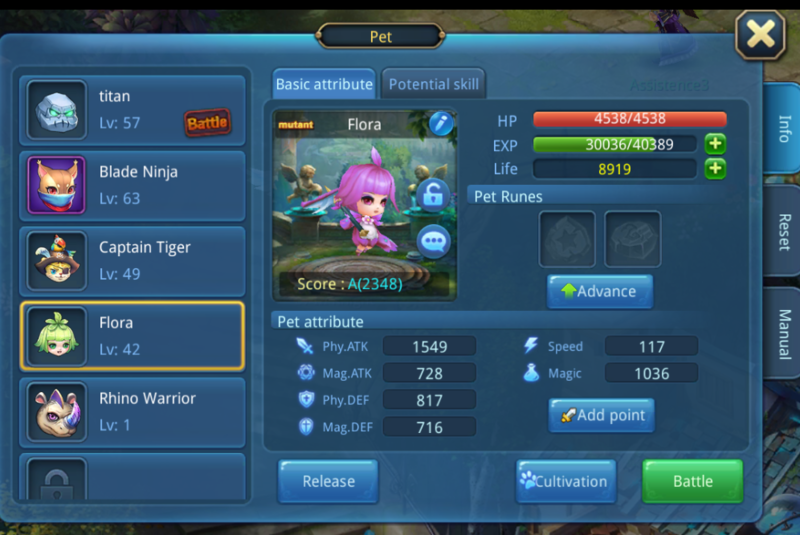 If players are not satisfied with the pets’ growth potential or skills, you can reset the pets. After the reset, the pets will get new growth potential, and with a possibility of gaining or losing the skills. 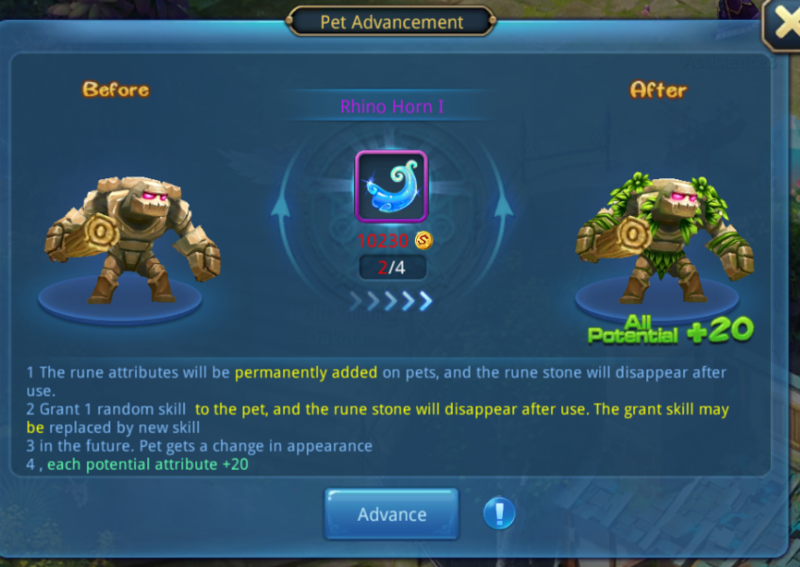 In this step, flying pig I believe that the pets’ growth potential will be much more important than the skills (Of course if your pet is a divine pet then reset is not require, as the skills and potential are at max). 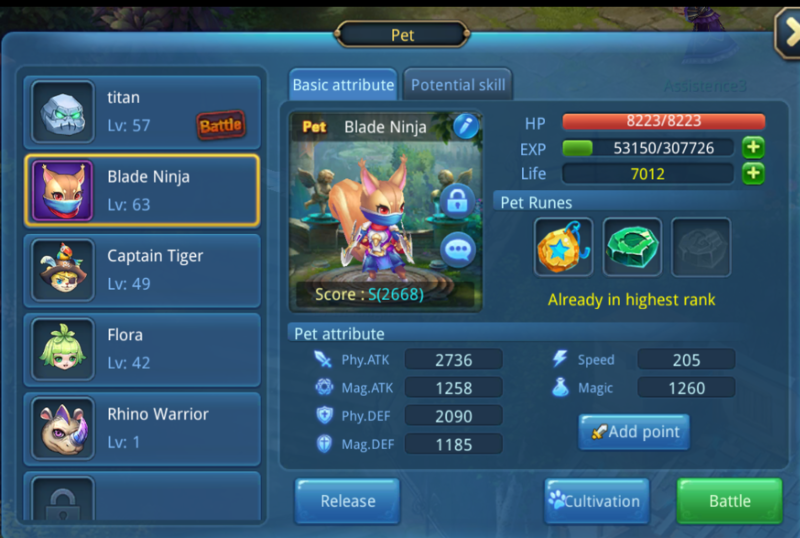 Every reset will have possibility of triggering mutation, which will give the pet a new appearance, potential point may exceed limit, and gain a new skill, loads of benefit! If you use Spring Water of Awakening will guarantee mutant, but take note for those who are unsatisfied with the mutant pets and wanted to reset again, the mutant pets may be reset back to non-mutant state, so if you want to reset the pets under the condition of mutant, you will need to use Pet Scroll. It can maintain the pet under mutant status while resetting. As for the ways to get Spring Water of Awakening and Pet Scroll is through spending a certain Star Essence when resetting, or through top-up GiftPack, weekly space and the mystic shop. Next is the highlight of this lesson, pet learn skills!!! As mentioned above, pets are divided into three types, then how to choose the right skills for these three types of pets? Flying pig is here to teach you by clearing your thoughts! Till here, there will be players that have a question: when the pet has 4 or more skills, then when learn skills will forget an old one, so is it the skills limit is only 4 or 5? Flying pig hereby tells you that, if you want to increase the number of skills, it is necessary to advance the pet. Each pet can wear talisman, there are 3 types of talisman: star talisman, moon talisman, sun talisman. Star talisman can only attach 1 skill, moreover is a low-level skill, while the sun and moon talisman normally attached with high-level skills, and can attach a maximum of 2 skills. 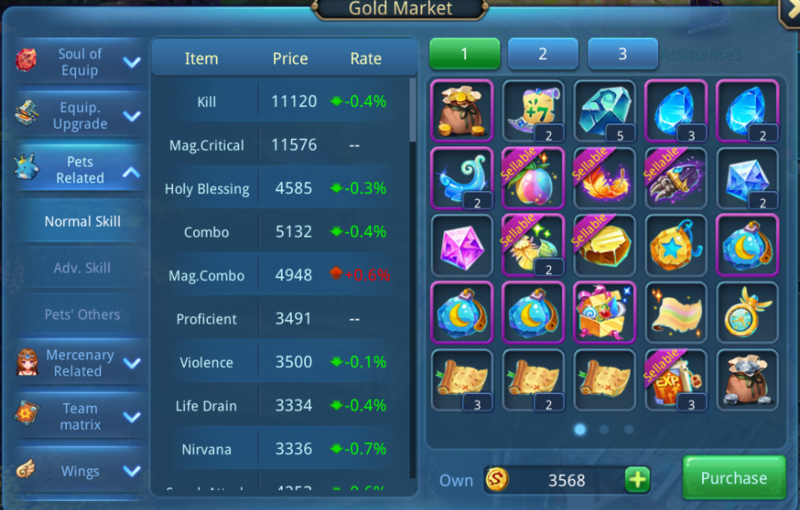 If you are not satisfied with the skills attached, you can purchase the reset stone of the corresponding talisman to reset the skills in the gold market. In addition, every two same talisman can be synthesized into a new talisman with new skills. Reset stone can only reset the skills, but cannot change the number of skills attached, while synthesis is likely to change the Talisman’s number of skills. In getting the Talisman you are satisfied with, you’ll just have to let your pet wear it to have 1-2 talisman skills. After the pet reaches a certain level and wear suitable talisman and the rune of corresponding level, you can now advance the pets. While the talisman and runes will disappear, the pet's potential will increase. If the talisman originally attach 1 skill, when the pet learn the skill will not forget the old skill, while if it attach with 2 skill, will randomly learn one of the skills. Pets that are Lv.65 and below can advance once, while above Lv.65 can advance twice; respectively require Unicorn and Rank 2 Unicorn. On the other hand, the advancement of divine and arcane pets will require Soul of Divine Pet and Soul of Arcane Pet, and can be upgraded twice before Lv.85. Lastly, it is flying pig’s recommendation time! Alright, that’s all for today’s subject, we’ll meet again next week!